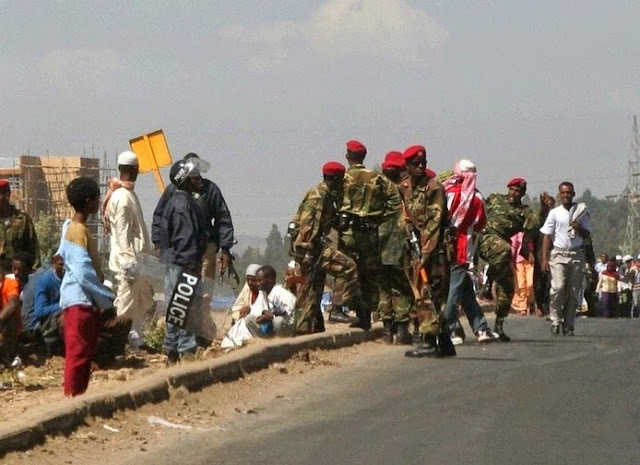 August 3, 2013 - Ethiopian government forces open fire on unarmed demonstrators throughout the country, killing 25 and injuring dozens more, according to Ethiopian activists who took part in the demonstrations. One witness says at least one child was among the dead. He also stated government security forces arrested over 1,500 protesters on Friday. For over a year, Ethiopian Muslims have been holding peaceful protests and mosque sit-ins over the regime's human rights abuses against their community and interference in their religion. Although the 2007 census claims Muslims make up only 34% of the country's population, one diplomat, who spoke on condition of anonymity with reporter Simon Allison, said these numbers are skewed to hide the fact that Muslims now make up the majority.